What's better than one new Torres SE117 guitar? 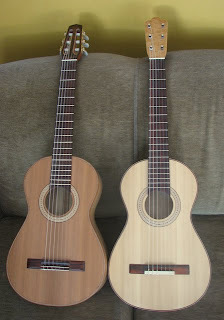 And what's better than two new Torres SE117 guitars? I finally got these guitars finished! Yeah, I can get them out of my shop where they have been coming together for over a year. The risk of damage increases with the duration of exposure to risk, and I was getting increasingly anxious about this. 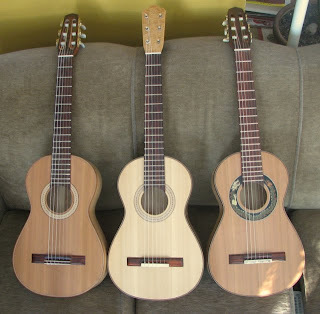 The center guitar is for me, and I built it fairly traditional. The other two guitars are for my daughters. Hopefully they will learn to play, I'm looking forward to that. Posted by Doug Ingram at 8:54 a.m.